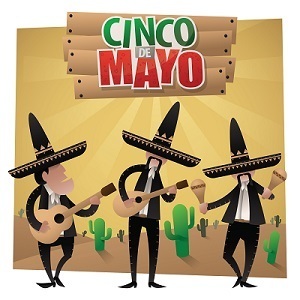 While Cinco de Mayo marks the Mexican Army’s underdog defeat of the French in 1862, many Americans may not know that history but still celebrate the holiday. As it falls in the beginning of May, children are beginning to get antsy for summer vacation, and adults are starting to get excited for summer barbecues. Basically everyone is ready for a parade and some great food and drink. A huge part of what makes Cinco de Mayo such a fun holiday is the plentiful and colorful decorations. From flowers to streamers, this holiday is about bright, happy colors. The guests at these parties and parades participate in this theme, wearing sombreros with colorful ties, summer dresses, and silly accessories like colored sunglasses. Even the food resembles the decorations, from taco-style main courses to the colorful polvoron cookies and cakes. Fruit-flavored water and lemonades are popular drinks along with adult beverages like margaritas and other cocktails. This site has information to help you plan the perfect Cinco de Mayo party for guests of any age. In the face of all this celebration, though, it is important to be mindful of the history behind the holiday and the struggles of the generations before us that created the world that we have today. All posts in "Cinco de Mayo"